The fees on airline tickets is getting absurd. 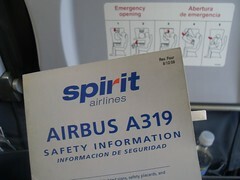 When I read that Spirit Airlines was going to start charging for carry-on bags, a staggering $45 at the gate, I figured the next news story we’d see was about Spirit Airlines going the way of the ghost. $45 to check your bag at the gate, that’s really dirty. At that point, you really have no choice… either you pay the $45 or they don’t let you know. Make a scene and I’m sure they can play the “terrorism card” and get you arrested. According to Airfare Watch Dog, US Airways will charge you $120 for a bag that weights 71 – 99 pounds. I can understand charging more for oversized bags, so the $120 is a bit of an unfair jab, but they still ding you $25 for the first checked bag ($35 for the 2nd, then $100 for bags three through nine). Southwest doesn’t start charging until you reach the third checked bag ($50 for 51 – 100 lb. bags and $50 for oversized).